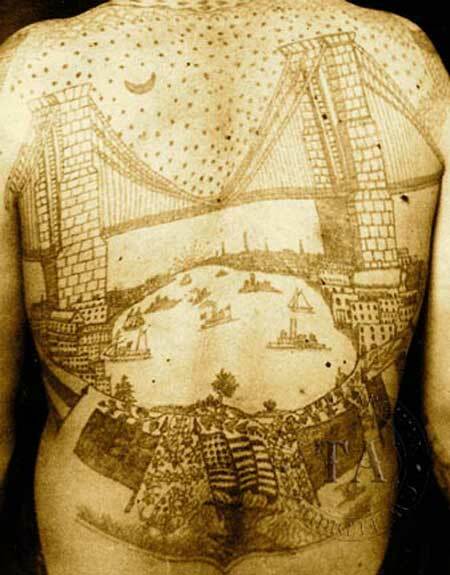 T “he latest bulletin from the Bowery announces that the Fat Lady continues to swell and that the tattooed lady now has the Brooklyn Bridge across her back, airily suspended in Chinese vermillion from columns of blue ink upon her shoulder blades. The Bowery never stands still. It changes as all things change, the Tattooed Lady’s red and blue trimmings included. If you have a spare afternoon and wish to test the aphorism that half the world never knows how the other half lives, moves, and has its being, go to the Bowery, first filling your pocket, or your purse, with dimes. The above paragraphs are from an October 23, 1887 news article from the New York Times. No author was given credit for the article but it speaks volumes about what the Bowery must have been like during this period. 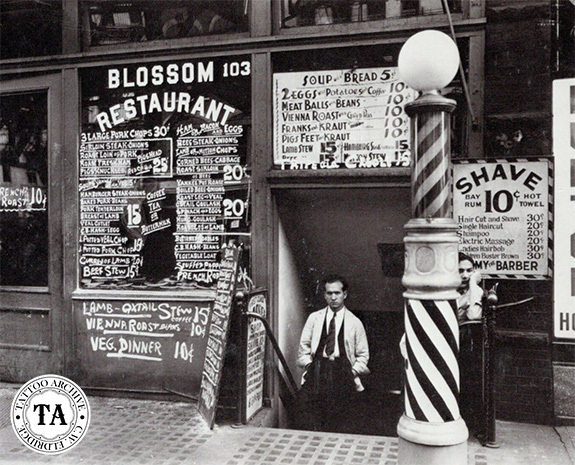 The area that encompasses the Bowery is located in lower Manhattan and until the 1960’s ban on tattooing was the center for American tattooing. 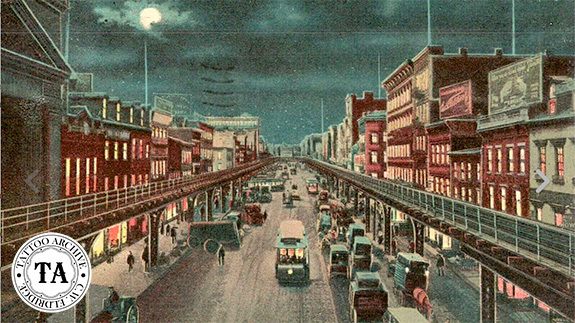 Bowery Street is the oldest street on Manhattan Island and as late as the 1860s it rivaled Broadway as a thoroughfare. By the late 1880s when the above article was written, the Bowery had given way to low brow concert halls, brothels, beer gardens, tattoo shops, Dime Museums and the like. 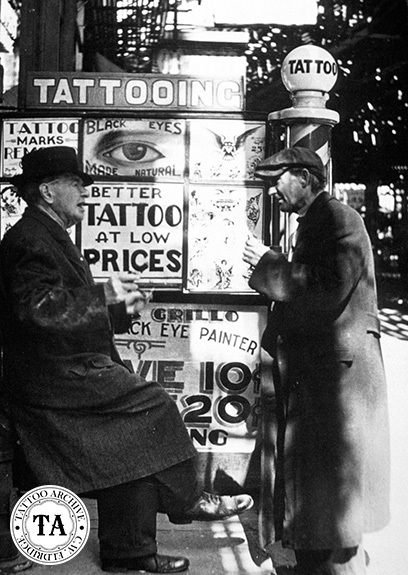 One thing that was left off the list of things a person could get and do for 10 cents on the Bowery was a tattoo. Although Charlie Wagner’s shop in the Bowery post dated 1887, he is famous for his cheap tattoos. 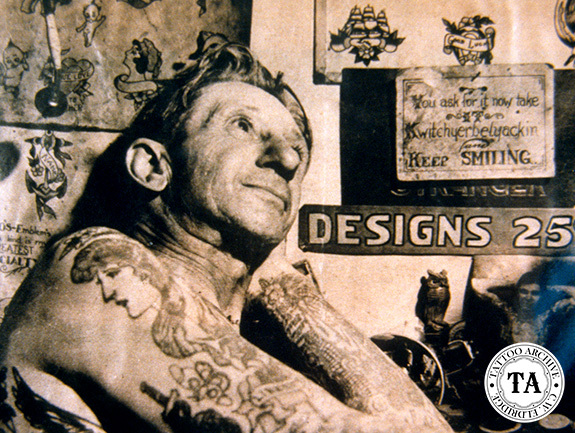 In Michael McCabe’s 1997 book New York City Tattoo, The Oral History of an Urban Art, tattooist Stanley Moskowitz stated that in the 1930’s Charlie Wagner was still doing 10 and 25 cent tattoos while the shop down the block was getting a dollar for the same design. Stanley also said that Bill Jones once visited Wagner’s room and he had jugs and jugs full of dimes and quarters from tattooing. Even as late as Charlie Wagner’s era a dime still had some buying power on the Bowery.